Managing documents, spreadsheets, photos, news clippings and other important materials related to donors, volunteers, gifts and grants can be a hassle. Particularly if you want to make sure they are available to everyone who needs them and also regardless of if you are in the office or on the road. 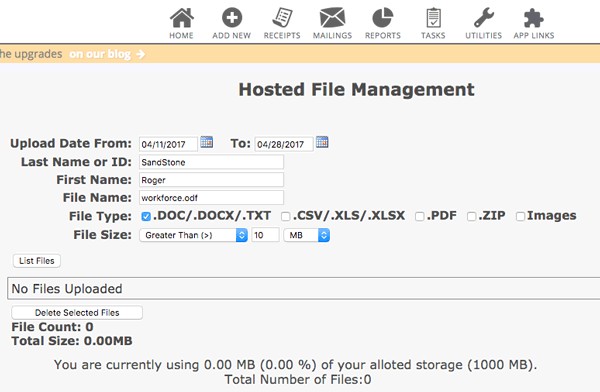 DonorPerfect Online’s new Hosted File Management Service makes it easy to solve these challenges cost effectively and without creating an extra IT burden. How It Works: Once activated, Hosted File Management allows you to link virtually any type of file to a donor, gift, pledge or transactional record. The file is automatically uploaded and stored on our secure servers and therefore can be accessed by anyone, anywhere who has appropriate access rights to the data. All files are automatically backed up each night and we even provide a handy tool to search for files across your database based on the donors name or id, type of file, when it was uploaded, or file size. Store common file types including .DOC/.DOCX, .XLS/.XLSX, PDF, .ZIP, media files and more!